After missing the sunset at La Jolla, in complete frustration, I decided to drive over the bridge and onto the Island of Coronado. I wanted to visit a restaurant that I had been to as a child, to get a shot of a staircase that my mother had taken a photo of my sister and I sitting on, which was a photo she always loved, and one I had seen my entire life. I will post both the original pic and the pic I took last night in a different blog, and explain it a little more, but it was pretty surreal looking the exact spot I had sat as a child. I was only about 10 years old, but I was shocked by the amount of little details I remembered about the place, and even though Im sure a lot has changed physically since I was last there, I was really shocked at how much the mind remembers. It was an emotional few minutes, which helped me to forget the frustration I had been feeling from missing the sunset earlier, but I really had no idea how the rest of the night was going to go. A night I had planned on getting a lot of shooting in on. 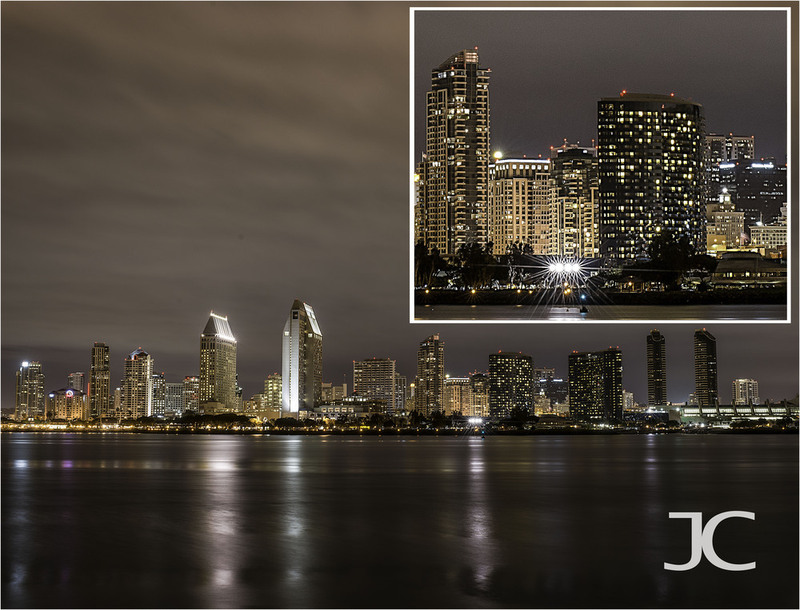 I walked out of the restaurant and staring me straight in the face was the bright lights of the tall buildings of San Diego across the bay, which I hadn't seen it when I first pulled up because I parked on the opposite side. I went to the car and instead of driving around to look for a better spot, I figured it was a nice night out so I just grabbed my tripod and remote trigger and started walking. I got to a walkway of what I believe was called Coronado Point, which was right on the water, and I had a beautiful view of the entire city of San Diego. I had seen photos of this view on the internet so I really wasn't too thrilled about getting this shot, but after the disappointing night I had already had, I figured I would give it a shot since the water was calm and the storm clouds were still hovering over the city giving it an almost eerie feeling. I wasn't sure where the photos I had seen of this view were taken, but I couldn't imagine a better view than the one I was staring at through the Live viewfinder on my D800 when I set it on the tripod. I took a quick shot and was less than thrilled with the way it looked, it was sharp and with the 35mm lens I was able to get in almost the entire city, but it wasn't anything special, it was definitely missing something. So, I thought about it for a min....bumped the shutterspeed up to 30 seconds, bumped the aperture up to f/11 to hopefully make some starbursts on some of the bigger lights, and knocked my ISO down to 100. I waited til all the boats passed and pulled the trigger on the remote release. Once the 30 seconds was up, I looked in the view finder and my jaw dropped...this set up nailed it. I immediately zoomed in and was blown away with the amount of detail I was able to get, I could almost see into the windows of the sky scrapers across the bay, and the starbursts from the smaller aperture gave it that extra little something the first shot was missing. This shot was more crisp and held more detail than any shot of this view I had seen on the internet, so this was it...my night could now end on a good note, time for a beer. I didn't take another shot, this was the one and only. I thought about taking a longer exposure to smooth out the water a little more, but I thought the amount of light this exposure let in was perfect. Since purchasing the D800, I hadnt really pushed it that hard with low light and dynamic range, mainly using it for portrait work and one night out at the East Point Lighthouse, but I didn't have the right equipment to truly push it. This was it. I was amazed at the amount of detail this shot had in it once I got back to the hotel and uploaded it into Lightroom. I made a virtual copy and cropped it down to 100% to show the detail it still held zoomed that far, but I really loved the star bursts that were produced from the row of lights down at the lower right of the shot. So, I added a crop that still shows how good the detail is when zoomed in, but also shows how beautiful the star bursts look from bumping the aperture up to f/11. I love me some star bursts.